To buy a padlock is to invest, not only in the lock itself but in the safety and security of your valuables and loved ones. With total property crime in the USA reaching a staggering 7 694 086 incidents in 2017 alone, strong, high-quality locks are no longer a choice, but a necessity. With the right research under their belt, anyone can locate the perfect padlock for their specific security needs and invest wisely. Check out our list of the Best Padlocks of 2019, and take a fresh, critical look at emerging padlock technology that could save your money, your loved ones, your valuables, and your life. Full Shrouded, Hardened Steel Body. Commercial 6 Pin Cylinder With Anti Pick Pins. Patented Keyway Cover Protects Against Drilling. The Stanley Shrouded Hardened Steel Padlock truly does leave all its competitors in the dust. Simply picking it up and feeling its 2lbs of hefty strength was enough to convince me that thing lock meant business, even though it was surprisingly sleek and aesthetically pleasing in its understated, silver simplicity. Lock-pickers will be very disappointed to find that Stanley has included a generous number of tamper-preventing features, such as the use of stainless steel ball bearings within the mechanism to prevent any illicit prying, a cylinder with anti-pick pins, and the coup de grâce of hardened steel shrouding, protecting the shackle from saws, cutters and the like. Stanley Hardware’s Hardened Steel padlock also makes sure you never stroll away from your padlock without locking it: it’s keyed-different, with a singular, individual key that won’t be released from the lock until the shackle has been secured again. It may prove difficult to secure on some smaller fixtures, although if you are buying an ASTM security grade 5 padlock of this caliber, you most likely don’t plan on using it daintily. What Are “Keyed Different” Padlocks? Padlocks that are “keyed to differ” are designed to open with individually assigned keys, as opposed to those that are “keyed alike,” which allow one generic key to unlock several padlocks. “Keyed different” padlocks are the most secure of the two, minimizing the number of keys in circulation, thereby lowering the chance of an intrusion. The standard way to determine the size of a padlock is by measuring the width of the padlock’s body, in millimeters. This measurement dictates how thick the shackle will be, as well as how much space will be available to the user during locking. “U-Shaped,” or “Long-Shackle” padlocks have a longer vertical rise and because of this can accommodate thicker chains, loops or cables. How Much Should You Spend On A Good Padlock? Buying a padlock is like buying a car. Buying a small, economical city car works wonders if you’re zipping through town for book-clubs and dance recitals, but for going off-roading adventure on the wild coast? It’s time to thinker bigger, harder and a tad more expensive. Combination padlocks like the 4 Digit Combination Lock for Gym, Sports, School (etc.) are light, fabulously convenient, and also don’t break the bank, with a very reasonable average retail price of $12.00 to $15.00. When locking up valuable items, or providing for the safety of others, it’s key to check out the specs: is the shackle guarded? Has the steel been hardened? Will it stand up to the test of time and stormy weather? For padlocks like the Stanley Hardware S828-160 Shrouded Hardened Steel Padlock, the answer is a resounding yes, for a relatively small price. Trustworthy, high-security padlocks like Stanley’s Hardware bring a level of comfort and safety far more valuable than the $30.00 + they go for. What Is The Most Secure Padlock? Padlocks can be measured for security by testing how well their bodies, shackles, and mechanisms hold up to tampering, lock-picking, and damage. There are several ways to reinforce and protect the vulnerable parts of the padlock, such as hardening the steel used to make the shackle, shrouding or “closing” the shackle, and inhibiting access to the mechanism within by its body remaining “whole” (as against in the creating of the Discus or “round shackle” padlocks, assembled out of two pieces). Padlocks like the Shrouded Hardened Steel Padlock from Stanley Hardware, as well as ABUS 37/80 Granit Alloy Steel Padlock exhibit all these features and more, clearly standing out as titans of protection. What Is The Most Secure Tubular Lock? When searching for optimal security, your experience matters. After a rocky start for the tubular lock in 1933, it underwent vast improvements throughout the century, and by 2007, the tubular lock was a staple on bicycle locks, manual tills, vending machines, and even security clearances. The Cobra-7 Lock is the prime example of what designers and engineers can achieve by relentlessly pursuing a good idea. Instead of having a perfectly cylindrical key, it has seven sides, providing a smoother user experience while flouting lock-pickers’ outdated tricks of the trade. What Is An Open Shackle Padlock? As opposed to the shrouded or guarded variety, an open shackle padlock does not have a metal sheath covering the majority of the shackle. The exposed shackle has a larger surface area, which makes it more vulnerable to attack. It does, however, have the benefit of being more forgiving of the size and shape whatever it is you are locking it around. What Should You Look For In A Smart Padlock? Although it’s easy to get wrapped up in the excitement of watching technology and security collide, smart padlocks can pose a real risk to users if not properly physically and mechanically reinforced. You should always inspect whether or not the padlock has been glued together somewhere, as this can be very easily pried open. Also, the success and safety of fingerprint security and Bluetooth rely on the robustness of the software that runs it all. Always choose a smart lock brand that offers a user-friendly interface while reminding yourself that, essentially, a lock is meant to be your little metal body-guard, not your Facebook friend. Handmade In Germany Since 1949. Stainless Steel Inside And Outside. ABUS-Plus Disk Cylinder. Highest Protection. Anti-Cut Plate For Added Security. ABUS is widely considered a big name in the high-quality security equipment industry, and it’s not difficult to see why. They have a very diverse, practical selection of padlocks available, specifically crafted to suit the wide variety of ways people make use of padlocks in their everyday lives. 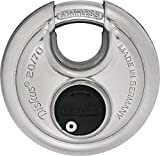 ABUS’s Diskus Stainless Steel Padlock is part of the “round shackle” family of padlocks, meaning that it’s shackle has a full circular bend, housed inside the body of the lock. This feature has its pros and cons. On the one hand, the Diskus does not have to rely on a spring to open and close, which makes it far more impervious to drill damage. It also reaps the benefits of a closed shackle by having the bulk of the shackle hidden inside. On the other hand, because the shackle is housed within the body of the padlock, the body is put together and two separate parts, which opens it up to the threat of prying. It also has a very small area between the shackle and the body, so locking it on smaller chains, or cabinets may prove the best way to make the most of your ABUS Diskus. 65 Rockwell Core-Hardened Lock Body. Optimum Drill And Pull Resistance. This padlock is all about the steel – hardened steel, that is! The ABUS 37/80 Granit Alloy Steel Padlock has a shackle, AND a body made completely out of hardened steel and stays comfortably protected from corrosion with its Black Granit Coating. Like the Stanley Hardware Hardened Steel Padlock, it is a closed-shackle padlock which protects the most vulnerable part of the padlock very effectively. It is less heavy than the Stanley but lacks its sleek, elegant charm that lets it fit in seamlessly with professional and personal spaces. The ABUS Granit padlock looks and feels far more industrial. Padlock For Gym, School & Employee Lockers. Lock Offers 10,000 Unique Combinations. Numbers Are Easy To Read And Reset . Durability is something lacking in a lot of readily available combination padlocks on the market today. If you are looking for something easy-to-use, key-free and multi-purpose, the All Weather Metal & Steel 4 Digit Combination Lock is your perfect match. Its weather-proof zinc alloy steel assures that you won’t find this padlock rusted off its hinges in the dewy morning air. 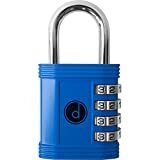 Although I find combination locks bring me less peace of mind than a keyed-different padlock might do, the number reels run smoothly and it does come in an array of fun colors, including red, blue and green. Perfect for the kids’ lockers! Body Made From Solid Brass. Pearl Nickel Plating. Calling all sailors, fishers, and mariners of all trades! ABUS had you all in mind when they designed and manufactured their range of “Marine” padlocks, adaptions of their already successful standard padlocks, specially crafted to withstand harsh weather, moisture, and coastal corrosion. This corrosion can cause the mechanism inside the padlock to become sticky and result in the entire padlock rusting over, so preventing this along coastal regions is a challenge for designer and user alike. The body of ABUS’s specifically-designed weather-proof wonder is made from solid brass with a pearl nickel plating, and the shackle is all stainless, rust-proof steel. Unfortunately, stainless steel is not as strong as hardened steel, and open shackle design does always leave the padlock vulnerable to attack its weakest point, so I think I’ll leave this one to the jet-skiers and the harbor-town residents until I get my very own private yacht to lock up. Copyright text 2018 by lockdownpros.com Important Disclaimer: The information contained on lockdownpros.com is intended for informational and educational purposes only. lockdownpros.com is a participant in the Amazon Services LLC Associates Program, an affiliate advertising program designed to provide a means for sites to earn advertising fees by advertising and linking to lockdownpros.com.